I’m a bit late with this one, as it’s been out ages now and I only saw it not so long ago. I must admit I didn’t want to see this, however I am so glad I did. This film of betrayal and trust is absolutely fantastic!! I hadn’t see the first one, but didn’t feel I needed to in any part of this film either, although I will now as I enjoyed this one so much! A must see, and correct me if I’m wrong I think there are still some showings of this. 10 years ago a disease had spread around the globe started by apes. 10 years on, apes and humans have to go head to head in a battle of trust and betrayal, not only that but a war that will determine who will be the Earth’s dominant species. I can’t fault one actor in this. They portrayed the emotion brilliantly, with both humans and apes, I don’t think they could choose a better cast for the film. They were all as equally as good as one another. There is so much I like about this film. The visual effects were outstanding, the way the apes talked was powerful. The action was beyond average and it was surprising how much you could actually do with a story line on apes, I was very pleasantly surprised. If I did have to put it down, it would be that I watched it in 3D and there was hardly any 3D parts involved. This film could relate to many real life issues without even meaning too. One of them being endangered species, the other one being war. 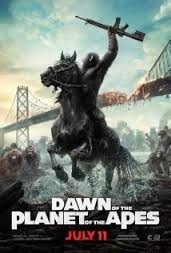 The apes state in the film that they don’t want war and they don’t want their home destroyed. More and more animals are set to face extinction each year, apes being one of them. Figures have recently shown that we have gone from 2 million chimpanzees, to just 300,000 left in this world. Why? We destroy their habitats, not only that but global warming. Its a real shame and I think this film can really relate to that. War I think also plays a big part in our world, in fact a major part. Whats most interesting is that Caesar, the head ape, constantly throughout the film tells us “apes do not kill apes”. Now there’s a lot of people out there that believe we were apes before we were humans. With all the wars that have happened and still are happening, “apes do not kill apes” suggests to me that they are relating to us as humans. He also says he does not want war. This basically tells me with us humans being told we could have been apes and are all the same, we shouldn’t fight with each other, and most certainly not kill each other. I could go on, but I don’t want to bore you, but there is certainly a lot more to this film than let on and its done in a really clever way.